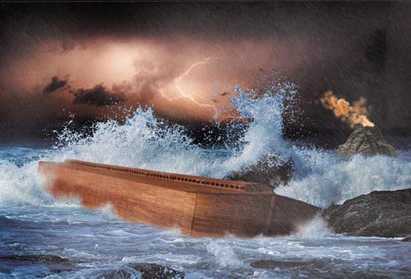 In some of my past writings I stated that the Great Flood of Noah occurred about 2700 BC. I came to this figure by using the Book of Jubilees in conjunction with the dating of the Exodus in the 15th century BC. Others using the Massoretic and Septuagint come to other dates. I also dated the Tower of Babel to 2313/2 BC. I now have revised my opinion and date the Flood to 2343-2 BC or 2404 BC and the Tower of Babel to 2170 BC. I also noticed that the Jewish calendar is about 200 or more years too short but in Judaism there is a higher date that takes these missing years into account though not often spoken about. One of the Rabbis in the Yeshivah I attended in Israel mentioned it but then quickly changed the subject. The shorter calendar was preferred as there is a Jewish tradition that new revelation of the Torah would end 4000 years after Creation. The shorter Calendar served two purposes it gave time for the writing of the Mishnah and moved the end of the 4000 years away from the birth of Jesus. Some talk about 163 missing years due to calendar shifts. However I believe the missing years come mainly from the dating of the time the Israelites were in Egypt. The short date supporters believe that the 430 years refers to the time of Abraham to the Exodus and thus the Israelites were only in Egypt for 215 years rather than 430. As a devout Catholic Jew I also take the dating of Blessed Anne Catharine Emmerich in her visions seriously which states that Jesus said the Creation of man took place 4028 years before the time he was speaking (he was 31 at the time). I also noticed that Luisa Piccaretta also speaks of the 4000 years before Jesus' birth. Thus I was loathe to accept a date older than 4000 BC. I was convinced at the time that my dating of the Flood to 2700 BC was correct. This however meant that there was only 1300 year period before the Flood. Previously I had been happy with a date of 5500 BC for the Creation of Adam but reading Emmerich and Picarreta made me pause and review my ideas. Jewish sources also speak about a 2000 years of chaos without the Torah from Adam to Abraham. And then a 2000 year period of Torah beginning with Abraham. Then a 2000 year Messianic Era follow by a 1000 year Sabbath Rest. Luisa also says something very similiar. My reading of the dates in the Massoretic and Septuagint just didn't fit. For some reason I had used the book of Jubilees to date the Flood and the Exodus but I had not gone back from Noah to Adam in the Book of Jubilees. How surprised and pleased I was when I read that the Book of Jubilees gives the antediluvian period as 1308 years and that the Samaritan Bible gives the period as 1307. Thus I could now have a date of 4000 BC for the Creation and still keep my dating of the Flood around 2700 BC. However with further study of all the evidence I went back to the Masoretic based dates which gives the 2340+/-5 and using the Book of Jubilees with the Masoretic text 2404 BC. Jesus also said in the visions of Anne Catharine Emmerich that there had been other ways of dating the years which is why there were differences. We know from Velikovsky that the year was 360 days and before the Exodus it was different again and also before the Flood. Emmerich in mystic vision said: "...The scholars of the present day who write about Egypt are in gross error. They accept so many things concerning the Egyptians as history, science, and learning, which nevertheless have no other foundation than astrology and false visions. That any nation could remain as stupid and beastly as the Egyptians is a proof of it. But these savants reject such demoniacal inspirations and practices as impossible. They esteem the Egyptians more ancient than they really are, because in those early times they appear to have possessed such knowledge of abstruse and hidden things.But I saw that, even at the coming of Semiramis to Memphis, these people, in their pride had designedly confused their calendar. Their ambition was to take precedence of all nations in point of time. With this end in view, they drew up a number of complicated calendars and royal genealogical tables. By this and frequent changes in their computations, order and true chronology were lost. That this confusion might be firmly established, they perpetuated every error by inscriptions and the erection of great buildings. For a long time they reckoned the ages of father and son, as if the date of the former’s demise were that of the latter’s birth. The kings, who waged constant war with the priests on the subject of chronology, inserted among their forefathers the names of persons that never existed. Thus the four kings of the same name who reigned simultaneously in Thebes, Heliopolis, Memphis, and Sais, were in accordance with this design, reckoned one after the other I saw too that once they reckoned nine hundred and seventy days to a year, and again, years were computed as months. I saw a pagan priest drawing up a chronological table in which for every five hundred years, eleven hundred were set down. I saw these false computations of the pagan priests at the same time that I beheld Jesus teaching on the Sabbath at Aruma. Jesus speaking before the Pharisees of the call of Abraham and his sojourn in Egypt, exposed the errors of the Egyptian calendar. He told them that the world had now existed 4028 years. When I heard Jesus say this, He was himself thirty-one years old." Venerable Mary of Agreda gives the year of the Creation as 5199 BC which seems to agree with many Septuagint manuscripts and the Roman martyrologies- however I suspect this is using another method of enumerating the years. Velikovsky seems to be saying that the length of the year in the Middle Kingdom was about 225 days long. 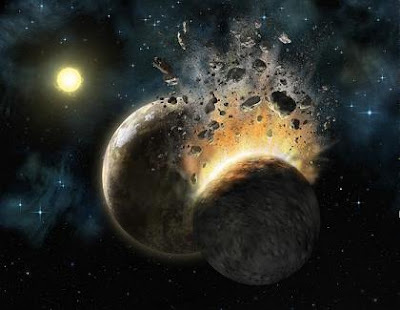 A Midrash states that there was a period when the earth revolved round the sun 400 times in 210 years- this may have been the 210 year period between the cataclysm of the Tower of Babel in 2313 BC (or 2170 BC) until about 2100 (or 1960 BC) in the time of Abraham (Sodom and Gommorah etc). It would also seem that the year was 360 days after the Exodus until 747 BC (or 690 BC or 660 BC). However if the year was also shorter after the Flood until the tower of Babel, then we may get to where 4000 BC based on 365.24 days equals 5199 BC based on counting revolutions of the earth round the sun. It would seem that the year was 364 days before the Flood according to the Book of Enoch and Enoch speaking in the Book of Jubilees. Some writers believe that the the year before the Flood had 360 days basing it on the account in Genesis. However Moses is beholding the Torah in a time where the year is now 360 days, so it is only natural that he describes it from the time perspective of the 360 days calendar. Even before the Flood the year may have changed after major cataclysmic events such as when a third of the earth was flooded in the days of Enosh. While reading and reflecting on Ramban's commentary on Torah in my holy hours of adoration, I came upon a reference by Ramban (Nahmanides) to Rambam about the genealogy of the nations connecting with the principles of the Creation of the world. Rambam (Maimonides) writes in Moreh Nebuchim III:50: "...the time which elapsed from Adam to Moses was not more than about two thousand five hundred years...". Thus Maimonides confirms that Adam was created about 4000 BC. Toriah.org website also mentions this statement of the Rambam and then mentions another place where he speak of the 2,500 years: "...When the Rambam discusses the mitzvah of shemitta and yovel, he identifies the precise historical year this mitzvah first took place as follows: “When did they first start to count? 14 years after they entered the land…7 years they were involved in conquering, seven years in dividing up the land…it therefore turns out that on the two thousandth, five hundred and third year from the Rosh Hashana of molad Adam haRishon, being the second year of creation (the first 5 days of creation were the last 5 days of the first virtual year of creation - see Rosh haShana 8a Tosfos s.v. Litkufos), they started to count. (Hilchos Shemitta v’Yovel 10:2)..."
Note: Of course those who accept the evolutionary beliefs will think I am mad. I have held different beliefs at different periods of my life about evolution and the age of the earth and the age of man but now hold to the age of man as 6000 years- the more I read and study the more I am convinced of this. Evolutionists often like to make out that anyone who doesn't believe in their ideas is an ignorant and uneducated hillbilly. I may be a hillbilly but I am certainly not uneducated and I know many well- degreed people who also do not hold with evolutionary theory. However I am always open to new evidence and being convinced otherwise. I also accept that one can be a sincere Catholic and hold to evolutionary ideas, this is an area which the Church leaves to science and the individual Catholic (with certain clarifications)to hold to the theories which they find most convincing. Both Pope Benedict XVI and Father Stanley Jaki (who personally both hold to some kind of evolutionary belief)have said that Catholics must not say that evolution is a proven fact.